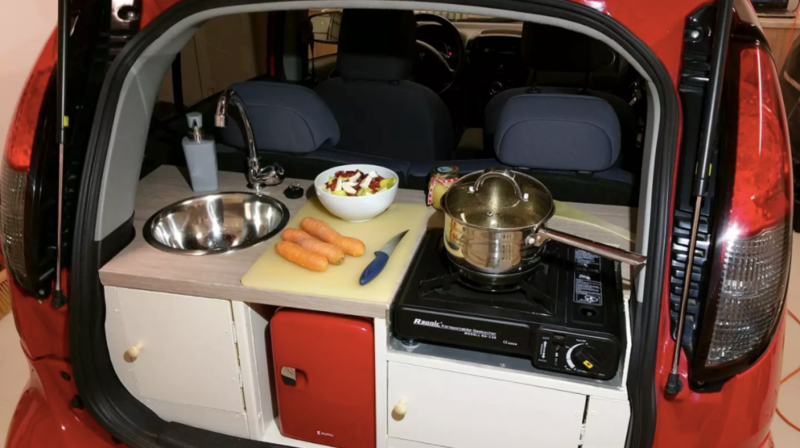 How can you install a fully functional kitchen inside a tiny electric vehicle? This sounds like a question never asked before in the history of mankind, but now it has been asked and answered by New Zealander Gavin Shoebridge, who has documented the daunting process on YouTube. Gavin is just one of thousands of YouTube DIYers (Do-It-Yourselfers) sharing their ideas, successes and failures in making their lives better through innovation, hard work and sometimes a bit of functional silliness. Shoebridge started the project by measuring the space between the back seat and the rear hatch door. His tiny four-door Peugeot doesn’t look like it could accommodate a fully functioning kitchen in it, but Gavin was undeterred.